These Amish handcrafted dining room chairs are sure to transform your dining room with their regal look. Bold back slats offer lumbar support, and tapered legs with carved detail set these chairs apart. Call one of our Amish furniture specialists today with questions on our Amish Mansfield Dining Chair. 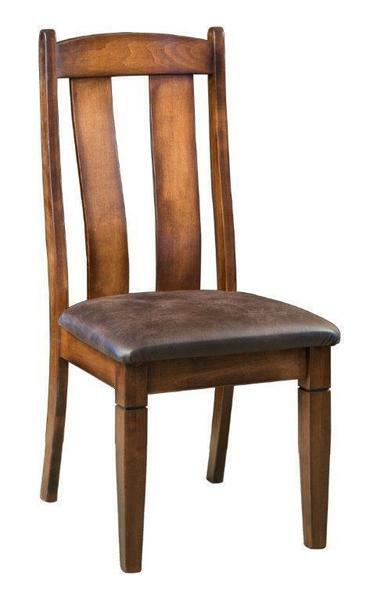 Pair these beautiful dining room chairs with our Amish Mansfield Leg Dining Room Table. Shown in Brown Maple wood with Nutmeg stain and 1524 Walker fabric. Jennifer! THANK YOU FOR THE PHOTOS!!! That is just perfect! WE are so grateful that you were able to do that........I do understand the belief's of the Amish and their desire to not use modern technology. So Thank you so very much......We appreciate what you did.....and cannot wait to have our beautiful custom made to order dining room set sitting in our newly remodeled dining room! Ashley the chairs we purchased for my customer look amazing! They are so comfortable too! Thank you for all your help and a nice experience. They are not in use yet and will not be for another month or so.